The growing movement against frac sand in Wisconsin and Minnesota — fueled by a high profile trial of activists earlier this month — shows no sign of stopping. First it was tea. Then it was salt. Now it’s sand. Successful nonviolent action often hinges on fusing the transcendent with the everyday. While it frames the struggle in visionary terms like “justice,” it does so in ways that we can touch, feel, see and experience up close. So, for example, the civil rights movement’s lunch counter sit-ins in the 1960s indissolubly linked the trans-historical crime of racism with the need all of us have to eat three times a day, driving home monumental injustice in terms most people could viscerally grasp: an obstacle to straightforwardly meeting the most basic of human needs. American revolutionaries got the point across about their British overlords by pitching a colonial staple into Boston harbor. Gandhi shook the same imperial system 150 years later by illegally making salt. Both cases pointed out the crises of their time by using material both highly symbolic but also utterly at hand, thus managing to transform an often abstract and elusive form of oppression, the overarching machinery of empire, into a reality that people could touch — and, by touching, change. Now, sand has entered the mix. Earlier this month, 30 people were found guilty in a Winona, Minn. courtroom of trespassing at two local facilities where silica sand used in hydraulic fracking is processed and transported. 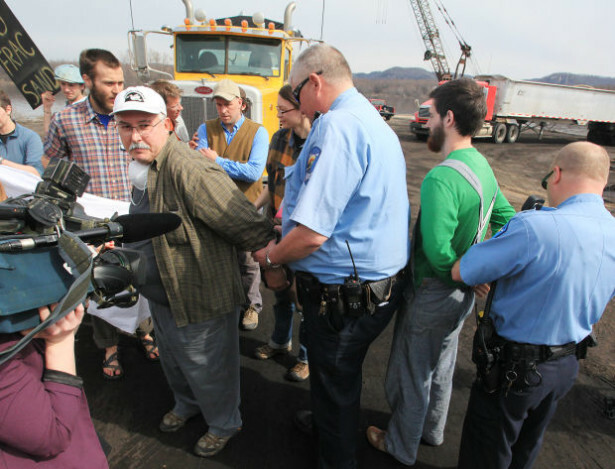 Stemming from a nonviolent action organized last April 29 by the Winona Catholic Worker and others from throughout the Midwest, the four-day jury trial held February 3-6 kept the original protest alive by trying to put “frac sand” on trial. (See a slideshow on the protest here and a local news report here.) Judge Jeffrey Thompson imposed a sentence of fines, court costs and probation. Silica sand is a necessary component of fracking, which reportedly uses 10,000 tons of silica sand to frack a single well. Wisconsin is the biggest producer of frac sand, with hundreds of mines. Winona, located near the Wisconsin border and the Mississippi River, has become a key transshipment point, with about 100 trucks carrying thousands of tons of sand crossing the city daily. That morning people stood in the way at two sites. Half the group assembled at the CD Corporation at the Winona Port Authority, where sand is loaded onto barges and then shipped down the Mississippi. Eighteen people nonviolently blocked trucks there, preventing them from unloading sand for about an hour. The others headed to a nearby sand washing and processing facility. Seventeen people occupied the driveway, shutting it down for two hours. Thirty-five people were charged with trespass. They finally had their day in court earlier this month. Peaceable civil disobedience is warranted when every other remedy for change has been exhausted. But it is also warranted in response to an emergency, even if every mechanism for change hasn’t been used. Indeed, it becomes a powerful tool by helping to both interrupt the harm in question and by alerting, educating and mobilizing the population to demand an end to that harm. In his testimony, Miles got at the necessity to respond to the escalating emergency of the climate crisis. He and his community could not wait. Willfully trespassing to save a baby in a house that is on fire is justified, or so the argument goes. In this case, the sand is headed to the next fracking well and they had to prevent the harm in the making. And so the community was alerted. A Wisconsin-Minnesota coalition is working on frac sand; the Winona City Council is considering establishing frac sand emissions monitors; and a few miles from Winona on the Wisconsin side of the Mississippi River, a local school district has just announced a legal battle to oppose the Glacier Sands truck-to-rail frac sand facility that’s proposed to be located across from one of its schools. I hope someone instructed the jury about their right to jury nullification. Although there is no question that these people are guilty, the jury can still find them innocent.